It can’t be easy to be the driver of a bus going long distances. Those things are huge, after all, and there you are speeding down the interstate with a bus full of passengers who just want to be anywhere other than on a bus, sitting near the bathroom, trying to work out a persistent leg cramp. And when one of those passengers attacks you, well, driving gets even trickier. On a Greyhound bus that set out from Los Angeles at 6:15 p.m. last night on its way to Phoenix, officials and passengers say the driver is a hero who managed to bring the bus to a stop while defending himself against a passenger’s attack, reports KPHO.com. An Arizona Department of Public Safety spokesman said three passengers were airlifted to a nearby hospital and 24 others were also taken to local hospitals. Law enforcement say the suspect is a 25-year-old man who allegedly attacked the driver while the bus was going 70 mph about 50 miles west of Phoenix. The suspect “basically went berserk in the bus and grabbed control of vehicle,” said the fire district chief. Despite the onslaught, the driver managed to bring the bus to a stop in the rocky terrain of the median — a few feet from oncoming traffic — after he and passengers restrained the suspect. “He did good job of maintaining control,” said the fire chief. The bust did jostle a bit he added, and three of the passengers with the most serious injuries were thrown from their seats. 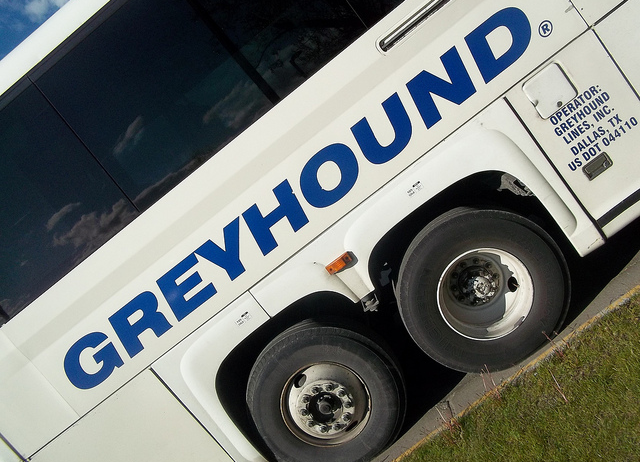 The bus driver suffered minor injuries but will be okay, he says, and Greyhound made arrangements to pick up passengers and complete the trip to Phoenix. The suspect and his apparent girlfriend ran into the desert but returned later and were arrested. He could face 48 counts of felony endangerment, 24 counts of assault and three counts of aggravated assault.